"Ten years after withdrawing from Gaza, the territory we left behind has become a safe haven for terrorists. Ten years later, in light of regional developments, the international community must take steps of its own. It must disengage from illusions, disengage from its constant bias against Israel, and disengage from murderous terror groups. It is time to disengage from old habits, and engage with the values we all cherish." First, I would like to congratulate New Zealand for its able stewardship of the Security Council this month. I thank Foreign Minister McCully, for being here today to preside over this session. I also want to thank, the UN Special Coordinator and Special Representative of the Secretary General, Mr. Nikolay Mladenov, for his briefing today and his ongoing efforts to help ease the situation in this volatile region. Ten years ago, this month, Israel disengaged from the Gaza Strip- and, I would like to remind you, that we also dismantled four settlements in the West Bank in order to show that there is a political horizon. We removed thousands of Israeli families from their homes, uprooted entire communities, and withdrew every unit of the Israeli Defense Forces. Not a single Israeli civilian or soldier remained in Gaza. We in Israel have always been told- including in this prestigious chamber- the obstacles to peace are the settlements, and the Israeli presence in Judea and Samaria. If only Israel would pull back, if only Israel would leave the Palestinians to run their own affairs- there would be peace. If Israel would only listen to the international community, the border between Israel and the Palestinians would be like the border between the Netherlands and Belgium. Ten years after withdrawing from Gaza, the territory we left has become a safe haven for terrorists. Hamas, an internationally recognized terrorist organization, has used and abused the people of Gaza to continue its war against Israel. Apparently they didn’t get the memo that an Israeli withdrawal was supposed to end the jihad against its people. Since the disengagement, terrorist groups have fired 15,000 rockets and mortars at Israeli citizens. They have dug terror tunnels underneath the border to attack Israeli towns and communities. WhenHamas joined the PLO government, the UN gave its warm blessing. WhenHamas refused to adopt the Quartet Principles and refused to recognize Israel’s right to exist, this Chamber looked the other way. And just recently, whenIsrael revealed to the world that senior Hamas members, Abdullah Kishta and Wa'el Faraj, collaborated with ISIS in northern Sinai to carry out a large scale attack on Egyptian military bases, not a single voice of condemnation was heard from this chamber. Hamas refuses to accept the three conditions of the international quartet- It refuses to recognize Israel, it refuses to abide by previous agreements, and- obviously- it refuses to renounce violence. The Quartet- not Israel- established these conditions, and Hamas flouts them. Gaza was supposed to be a model of a stable, self-governing society. Instead, it became the model for lawlessness, violence, and destabilization. Gaza was supposed to be the pilot project for Palestinian governance in the West Bank, but the pilot crashed the plane. Since then, a similar model has proliferated all over the Middle East. From the Mediterranean to the Caspian, states which we knew yesterday, are no longer here today, and others are on the verge of disappearing tomorrow. We live at a time in which nation states are disintegrating before our eyes. New political structures have not been established, and bands of religious zealots are rushing in to create new theocratic states in this vacuum. Iraq, Syria, Yemen and Libya no longer exist as we knew them. Now we have the Kingdom of Al-Qaeda, the Republic of Jabhat al-Nusra , Houthistan, and of course, the Islamic State. This is not the Middle East we learned from our high school geography teachers, those borders are now unrecognizable. The Google map of the region must be updated every day, based on which terror group has seized control of which area during the previous night. In the Sinai peninsula, terrorists have declared war on Egypt. Earlier this month, Ansar Bait Al Maqdis, the ISIS branch in Egypt, carried out an attack on 15 Egyptian military positions in Northern Sinai, killing more than 70 Egyptians. Let it be clear: these groups are not only looking to terrorize Egyptians, they are trying to destabilize the entire region. These emerging radical factions differ in their ideologies, in their interests, and in their goals, but they all share one thing in common. They seek to impose their radical religious beliefs on all who come under their control. In the new lawless Middle East, there is only one law- submit or die- and sometimes you are not even given the choice. A butterfly flaps its wings in one place and causes a storm halfway around the world. When the earth shakes in the Middle East, you can feel the vibrations under your feet from Europe to Asia. In one day, just last month, we witnessed terror attacks on three continents- a day of bloodshed in which terrorists murdered 65 innocent people in Tunisia, in Kuwait, and in France. Many in the international community were captive to their dreams of a new Middle East but we can no longer just hit the snooze button. It is time to wake up. We are, all of us, engaged in a large scale war over the future of the Middle East, and the rest of the world. What will our region look like? Will it progress to an era of democracy and human rights, or regress to a collection of fundamentalist states? Which countries will remain standing? Will it be the countries we have known for a century? Or, will much of the Middle East become known simply as the United Islamic Empire? The trends are against us. If we don’t wake up in time, we will get all the answers wrong. Israel doesn’t have the luxury of waiting for the rest of the world to wake up. Before the west had to deal with the Islamic State halfway around the world, Israel had to deal with the Hamas terror state on our doorstep. It is now exactly one year since Operation Protective Edge. One year ago, Israel was forced to protect its people after Hamas terrorists kidnapped and killed three Israeli youth, launched hundreds of rockets and mortars at Israel, and rejected or violated every truce offered to the parties. The Israeli Defense Forces faced a cruel and cynical enemy, which knows no red lines, and which violated every code of morality the civilized world holds dear. Hamas launched their indiscriminate attacks from residential areas which they had turned into military staging grounds. Hospitals, schools, and UN facilities were used as weapons depots, playgrounds were used as launching pads, and innocent children were used as human shields. Firing rockets on civilians from behind civilians is a double war crime- and the international community should say so, loudly and clearly. While the rockets constituted terror from above, Hamas also sought to unleash terror from below. In Gaza, there is no money to rebuild hospitals or to pay teachers, but there is a lot of money to dig and expand terror tunnels. When Hamas finishes its work, Gaza will be the first city in the world that has a modern infrastructure underground, before it has a basic infrastructure above-ground. As we sit here today, one year since last summer’s conflict, we must ask- what has really changed? We can start answering this question by looking at the Hamas military parade in Gaza this month, where Hamas publicly displayed two newly developed rockets. For anyone who didn’t get the message, Hamas explained, and I quote “Until now the enemy has only seen a small part of our true power”. End of quote. Hamas has intensified its efforts to repair its network of terror tunnels, and to smuggle, stockpile, and develop new weapons. A year after the operation, the UN has done nothing to weaken Hamas, but plenty to criticize Israel. Two weeks ago, the UN Human Rights Council’s Commission of Inquiry, also known as the COI, published its report on last summer’s conflict. Let me give you an example of how professional, insightful, and thorough this report was. The authors of this report said, and I quote, “The commission cannot conclusively determine the intent of Palestinian armed groups with regard to the construction and the use of these tunnels”. End of quote. I have a suggestion. Maybe these tunnels were intended to be the new METRO system in Gaza? In that case, as a previous Ambassador to the Court of St. James, let me give you a tip - Don’t forget to mind the gap. Perhaps the UN is simply suffering from a severe case of tunnel vision. After all, this is the same UN that appointed as the head of this commission, William Schabas, the law professor who conveniently forgot to mention his prior paid consulting job with the PLO. Ladies and gentleman, I am holding in my hands a 200 page long Israeli report that details the systematic and widespread atrocities committed by Hamas, and analyzes Israel’s military response. 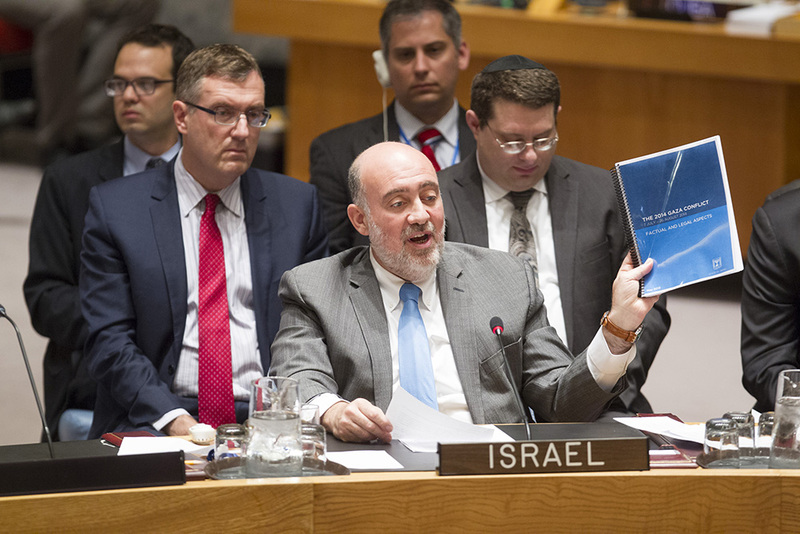 If someone at the United Nations had read this report, they would have had a broader perspective on the threat Israel faces, and recognized Hamas for what it really is- an internationally recognized terrorist organization. When Palestinians in the Yarmouk refugee camp were massacred by ISIS, and the Secretary General said that quote, "The refugee camp is beginning to resemble a death camp" End of quote. We didn’t hear any call for a COI from the Human Rights Council. The UN prides itself on taking a “balanced” approach to international affairs. Well, that’s very interesting. Saudi Arabia has been carrying out massive and indiscriminate airstrikes in Yemen for months, which have hit UN facilities, hospitals, schools, and civilian neighborhoods, and left entire families dead. And yet, surprise surprise - no Commission of Inquiry, no Board of Inquiry. This is the same UN that made it clear to us, Israel, that it is standard operating procedure to automatically establish a BOI any time a UN facility is hit – That’s a “balanced” approach indeed. When it comes to investigating the results of war and conflict, it seems the UN believes, to paraphrase George Orwell, that all people are equal, but some people are more equal than others. Israel’s struggle against the Hamas rulers of Gaza does not prevent us from playing a key role in helping the people of Gaza. Hundreds of trucks enter Gaza every day, carrying thousands of tons of food, humanitarian aid, medicine and more, all without restrictions. Since October 2014, Israel has supplied Gaza with 1.3 million tons of construction material. While Israel is fully committed to the implementation of the Gaza Reconstruction Mechanism and will continue to cooperate with the United Nations in this important mission, the Palestinian Authority not only refrains from taking part in this effort, it puts obstacles in the way of those who do so. The PA is quick to condemn Israel at the UN, but on the ground, they refuse to assume responsibility for the people of Gaza. The Palestinian Authority has no authority over the Gaza Strip, and apparently, it doesn’t want any. 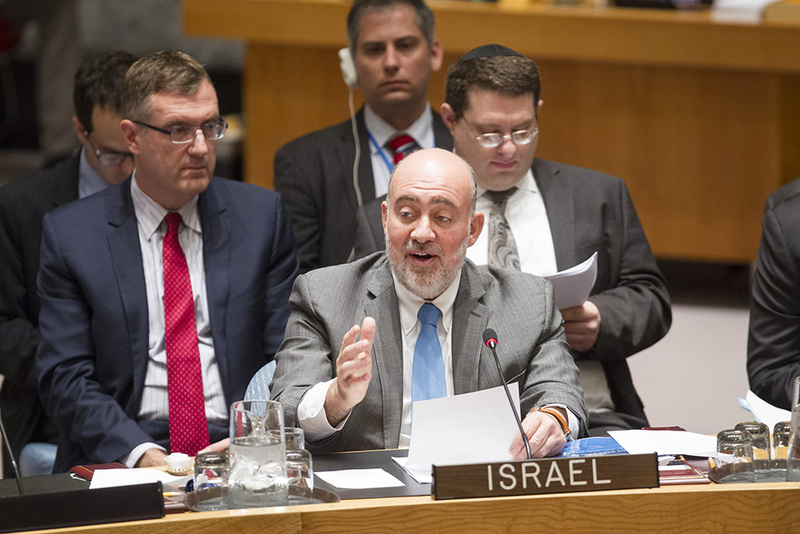 Last September, this Council tried to pass a resolution to address the situation in Gaza. While Israel agreed to the resolution, the Palestinian president dragged his feet, obstructed the process, and eventually rejected the proposition altogether. The resolution would have restored PA governance over the people of Gaza, granted the PA control over the crossings into Gaza, and disarmed Hamas. This resolution would have given control over Gaza back to the PA, but Mahmoud Abbas rejected it. The Palestinian leadership is apparently too busy settling scores with political rivals in the PA to worry about what happens in Gaza. Just look at how Abbas treated the former Prime Minister of the Palestinian Authority, Salaam Fayyad- a Palestinian leader esteemed and respected in the international community. Abbas seized the funds from Fayyad’s NGO called “Tomorrow for Social Development” and froze his accounts. The Palestinian Authority never misses an opportunity to avoid responsibility. The international community should not shy away from criticizing the PA, and pushing it to assume responsibility. Avoiding responsibility has its price. Last month, there were numerous terror attacks, including two that were fatal. Dani Gonen and Malachi Rosenfield were shot and killed by Palestinian terrorists as they went about their daily lives. יהי זכרם ברוך - may their memory be a blessing. These murderous attacks are just part of an increase in terror attacks we have witnessed recently. Yet, the leadership of the PA remains silent, failing to condemn the murder of innocent people. Three days ago, this Council adopted a resolution endorsing the nuclear agreement with Iran. This agreement is bad for Israel, its bad for the region, and bad for the world. It is an historic mistake that brings Iran closer to achieving its 30-year goal of attaining nuclear weapons, and fuels its drive for imperial expansion. This resolution took the first step to lift the sanctions without waiting to see if Iran complies with even one single obligation in the agreement. What makes the international community so sure that Iran will live up to its end of the bargain? When the nuclear deal was struck with North Korea, good and well-intentioned people believed that it would prevent North Korea from developing nuclear weapons. Well, sometimes good intentions lead to wishful thinking. Iran is the source of instability in the Middle East. In Syria, Lebanon, Yemen, and Iraq, and other countries, Iran has deployed its Revolutionary Guards in order to expand its empire. Iran is also the godfather of terror around the world. Countries from Bulgaria to Argentina have experienced the horror of Iranian terror first-hand. For years, Iran has armed and financed Hezbollah in Lebanon, and Hamas in Gaza- two groups which make clear their goal of wiping Israel off the map. Many members of this council described the agreement as the opening of a new chapter. Well, I’m sorry to ruin a good book, but Iran’s supreme leader Ayatollah Khamenei has a different story to tell. You may have signed a deal with the poster boys of Iran, Zarif and Rouhani, but in Iran, the Ayatollah and his Revolutionary Guards are the ones calling the shots. Khamenei declared that even after the agreement is signed, Iran will continue supporting terrorists in the Middle East and around the world. "We have told the P5+1 . . . that we will supply arms to anyone and anywhere . . . and will import weapons from anywhere we want and we have clarified this during the negotiations". It is worth noting the fact that Israel and many states in the Arab world share grave concerns over the implications of the agreement on the stability of the Middle East. Ladies and Gentleman, when Israel and the Arab world share the same concerns, the world should pay attention. Instead of working towards a solution in our region, this agreement has strengthened the source of the problem. This agreement has given the source of the problem- Iran- the money to carry out its destructive ideology. This agreement has also given it the time and the opportunity to develop a nuclear arsenal. This agreement grants Iran not one, but two paths to the bomb. Iran can get the bomb by cheating, or it can get the bomb by keeping the deal for ten years, and then assembling it immediately afterwards. And 10 years go by in the blink of an eye. Under the terms of the agreement, enforcement is largely dependent on Iran's goodwill. Inspections are not “anywhere, anytime.” The deal gives Iran the ability to delay inspections of undeclared sites for 24 days- enough time to hide a smoking gun. Under the terms of the agreement, there are not sufficient limitations on Iran's weaponization activities. Iran already has the enrichment capability to produce a bomb. It also has the suitable delivery means. Without limitations on weaponization, the way is paved for Iran to assemble a bomb. Now, in the summer of 2015, the countdown to Iran becoming a threshold nuclear state has begun. In 5 years, the embargo against conventional weapons will end, in 8 years, they can acquire missile technology, in 10 years, unlimited centrifuges. This is not disarmament, this is a timetable for Iran to build nuclear weapons. In future years, the consequences of this mistake will become clear to all, but for Israel, tomorrow is already too late. Ten years ago, Israel took a significant step with its disengagement from Gaza. Ten years later, in light of regional developments, the international community must take steps of its own. It must disengage from illusions, disengage from its constant bias against Israel, and disengage from murderous terror groups. It is time to disengage from old habits, and engage with the values we all cherish. Thank you very Mr. President"